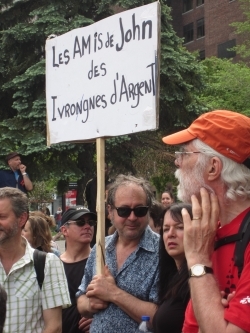 MONTREAL—Everything and its opposite has been said about Quebec's historic student strike. Strikers and their vocal supporters have been pitted against hostile opinions from the government and middle class Quebeckers. At the heart of much of the debate is concern that without a tuition fee increase the government will instead raise taxes. As Jonathan Mercier, a government lawyer and father of three, explained recently, he supports the principles behind the student strike, but he simply has no faith that the government of Quebec will not raise taxes, leaving no money in his wallet. Mercier isn't alone in distrusting the government: According to a July 2012 poll, IPSOS Reid found that 95 per cent of Canadians do not trust their politicians. Combine this lack of trust with a constant squeeze on middle class wallets—debt to disposable income ratio for the average Canadian family hit a new record high this summer of 152 per cent—and you have an explosive situation when a student knocks on your door asking for a freeze on their tuition. The impact of the provincially appointed Charbonneau Commission into allegations of government corruption has already been felt in municipalities across Quebec. In 2011, Quebec City initially forecast a $170 million budget for its road works and infrastructure repairs. However, following the start of the commission's hearings, the construction companies lowered their prices, offering the same services for $130 million: a 25 per cent “savings.” Investigations into corruption are said to be leading construction companies to cease their collusion. According to its annual budget, the government of Quebec plans to spend over $9 billion on road work and infrastructure over the next few years. Even if prices for the provincial government only fall by half as much, let’s say 10 per cent, that equates to $900 million more in the pockets of taxpayers. Eliminating this “subsidy” to the construction industries, known as “extras,” could finance free university education. Savings: at least $900 million per year. The Plan Nord, which aims to ramp up resource development in the northern 70 per cent of the province, seems to be a perfect demonstration of why taxpayers are stuck with never-ending provincial deficits. Studies show that government officials are making unprecedented and unexpected gifts to mining companies. Before the reform to Quebec mining royalties in 2010, the provincial government received $287 million in royalties from mining companies over a 10-year period. Previously considered one of the most generous royalty programmes on the planet, Quebec has since reformed its system, increasing the rate from 12 to 16 per cent in royalties on profits (but not on total production). Quebec should now, in theory, be receiving $400 million per year from an annual mineral production of $8 billion. Profitable mining companies that were once made to invest in infrastructure, such as roads and ports, have now been told the Quebec government will support them via Plan Nord . Over the next 25 years, the government estimates $82 billion will be spent on the Plan Nord (roughly 50 per cent from Hydro-Quebec, 30 per cent from the government and 20 per cent from companies) generating $14.2 billion. The hidden social and environmental costs would be roughly $6.15 billion. We can therefore expect an $8.45 billion deficit over the next 25 years for the Plan Nord. 1. Apply the 16 per cent royalty on total mineral production instead of on profits: $1.28 billion in revenue per year. 2. Require companies to build and maintain their own roads: $2.8 billion in savings over 25 years. 3. Rethink the Plan Nord so that it will be affordable for taxpayers, socially just for First Nations and ecologically sound for Earthlings and Martians: at least $8.45 billion in savings over 25 years. Luca Palladino is a HEC Business School graduate who studied capitalism to understand the nature of the beast. He studied economics but had to read Adam Smith and Karl Marx in secret because they only taught him math at school. You can follow his work at @lukaesque. CBC misrepresenting Quebec student strike?